The Orange County Registrar of Voters has verified that the petition asking for a public vote on the Museum Tower project had the legally-required number of valid signatures — in fact, likely more than twice the required number, gathered in just two weeks in December. The City Council affirmed that certification at its February 14, 2017, meeting, but in view of a lawsuit filed by the Orange County Museum of Art challenging the validity of the petition, deferred further action on the matter until its February 28 meeting. At the February 28, 2017, meeting, recognizing what the Council saw as overwhelming public opposition to the project, and to avoid the cost of conducting a largely pointless election, the Council decided not to call for one, but instead exercised its option to introduce an ordinance repealing all previous Museum House approvals, save only its November 29, 2016, certification of the Environmental Impact Report. Meanwhile, on January 6, 2017, OCMA filed a lawsuit (not served until late February) challenging the validity of the referendum petition, and in February sought emergency court orders barring the City Council from doing anything more about the matter until the lawsuit is resolved. While the lawsuit has not yet been resolved, the court declined to issue the orders, so the City Clerk published, and the City Council adopted the repeal ordinance, without comment, via a “second reading” at its March 14, 2017, meeting. Mayor Muldoon and Council members Herdman, Avery and Dixon voted in favor. Council members Peotter and O’Neill voted no. Mayor Pro Tem Duffield was absent. Assuming the petition is found valid, those repeals would be effective 30 days after the March 14 “second reading,” and for the following year the Council would not, under California law, be allowed to entertain any similar proposals for the OCMA property. Even if OCMA succeeded in having the petition declared invalid, it would still seem to be within the Council’s power to reverse its 2016 Museum Tower approvals and sustain its repeals. However, the repeals would not themselves then enjoy the one year protection from further change that they would have if made in response to a valid public referendum. For further details of the lawsuit, which has since become even more complicated, visit the LITS website at LineInTheSandPAC.com. 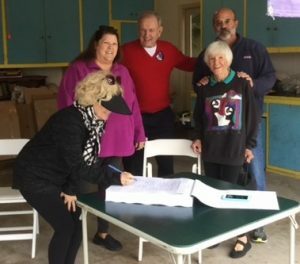 Although IRS constraints limited SPON’s participation in the later phases of the petition drive, SPON commends the remarkable outpouring of volunteerism that went into the petition effort and the exceptional showing of Newport Beach citizens’ concern about their quality of life that the petition signatures demonstrated. We are confident the people’s right to petition their government and the Council’s action in response to that unprecedented show of public sentiment will prevail. Congratulations to all on the successful signature collection effort! Question: I’d like to make a donation to help defer Museum Tower Referendum expenses. How do I best do that? Answer: As a 501c(3) tax-deductible organization, SPON is limited as to the amount it can spend on ballot issues. That threshold has been met. We welcome your financial support, but additional donations cannot generally be spent on referendums or ballot measures. Because of the massive petition size imposed on us by the Council, Line in the Sand PAC (LITS) incurred considerable expense in preparing signature-gathering packets for the Referendum . . . in excess of $30,000. And LITS faces large ongoing legal expenses to defend the referendum in court. We encourage SPON supporters to donate directly to Line In The Sand PAC. Please know that donations to LITS are not tax deductible. Donations to SPON are deductible, but limited as to use by federal law. Thank you for your support of either or both organizations. It is very much appreciated. An appeal of the Planning Commission’s denial of the AutoNation Porsche proposal. Approval of the Local Coastal Program Implementation Plan reviewed on October 25, 2016. A 15 year extension of the expiring Irvine Company development agreement for Newport Coast. By way of background, the AutoNation Porsche proposal had been rejected by the Planning Commission on October 6, 2016, and neighborhoods in the areas most directly impacted (Cliff Haven, Kings Road, Newport Heights, and Bayshores) had banded together and circulated a petition similar to the one many of you signed for 150 Newport Center. Their position was that the AutoNation Porsche dealership was too big, did not fit into the maritime nautical vision for Mariners’ Mile and that potential negative impacts on long-established Newport neighborhoods need more analysis, including an environmental impact report (EIR). A link to their petition is available here. Developers withdrew their application for the 150 Newport Center (car wash) condo conversion proposal in advance of the September 27, 2016, City Council meeting. Congratulations to all our friends who helped by signing the petition, attending and speaking at meetings, sharing your concerns with your own personal networks. A recap of the petition, signed by over 1,600 supporters, can be found here. We at SPON thank you for your past support both in time and/or treasure to continue working to maintain the high quality of life we enjoy in Newport Beach. SPON‘s concerns and input are considered by city staff, council members, and committees and commissions because of your backing. The resounding defeat of Measure Y sent a clear message that perhaps was not well heard. The business-as-usual attitude continues, and changes to the general plan continue full speed. “Planned Communities” that are supposed to be ten acres are put on one acre without concern; height limits which were raised from 35 to 50 feet are quietly allowed to go higher; spot zoning is casually used to defeat the intent of the general plan. The City of Newport Beach is not unique in this trend of spot development. Our neighbors in Costa Mesa are seeing exceptions popping up like mushrooms and are responding by pushing for their own “Greenlight” initiative. A more distant neighbor, Hollywood, is seeing community reaction to massive development exceptions to their general plan. The influence SPON has with commissions and elected officials is directly related to the strength of our membership. Elected officials and commissioners take note . . . and listen . . . when the meeting room is full of our supporters. We have seen that time and again this year in city and state government meetings: Newport Coast Entitlement Rights “error”, Newport Center Villas (site of Beacon Bay Car Wash), Back Bay Landing (adjacent to Bayside Village Mobile Home Park), West Newport-Mesa height zoning amendment, Banning Ranch development, and more. The year 2016 is going to present challenges and opportunities for the quality of life in our community. SPON will be there to meet those challenges and to capitalize on the opportunities. We hope that you will continue supporting SPON with your time, your treasure, and your continued willingness to participate when called on.